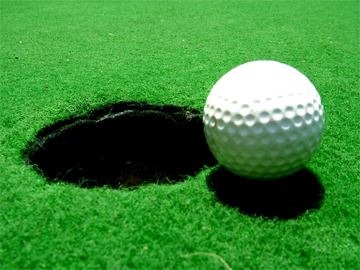 Spring is here which means for many it is time to start getting into shape for golf season. While low-impact, golf is physically demanding on the spine and musculoskeletal system and injuries are actually quite common. With more experience golfers, injuries tend to occur from overuse while less experienced golfers are prone to more acute injuries due to poor form and improper training. In order to stay healthy and enjoy the golf season, it is imperative to train properly with core strengthening and proper mechanics. Low back pain is extremely common in golfers as the aging spine with decreased flexibility is subject to tremendous rotational and compressive loads. This may lead to muscle strains, disc disruption, stress fractures and joint inflammation. On top of all of this, many swing techniques involve rotating the spine beyond normal physiologic limits and this generates injury-inducing stress on the spinal elements. With this said, it is crucial to train properly and stay flexible throughout the season to stave off spinal injuries. First and foremost, if you are already suffering from back pain then you are much better off limiting your play and focusing more on rehabilitation. Furthermore, if you are not familiar with core strengthening or proper spinal mechanics enlisting professional help via a physical therapist or personal trainer is never a bad idea. Rehabilitation begins with identifying the body’s weak spots and instabilities and working on conditioning to overcome them. With low back pain, people are often directed to increase their spinal range of motion and flexibility but this may sometimes prove to be counterproductive. Instead, particularly with golf, the focus should be placed on lower extremity flexibility through the hips, knees, and ankles with attention to stabilization of the central core. Put very simply, as you are working on your extremity muscles always focus on engaging your abdominal and spinal muscles to stabilize your spine. This turns any exercise into a core strengthening exercise. A good start is to employ low-impact activities which emphasize resistance training. Try walking at an incline or using the elliptical trainer and mix in resistance-based exercises such as cable-crosses or rowing. Always use proper form and be sure to ask for professional help if you are unsure of your technique. 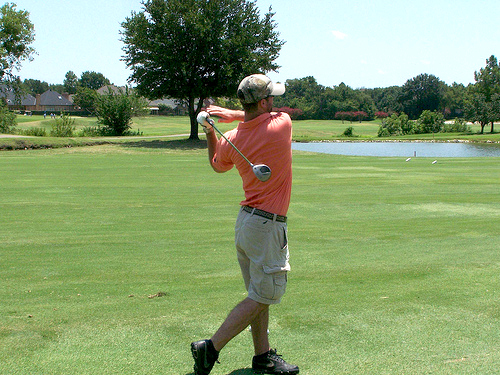 When it comes time to hit the links, your training and preparation means everything. The morning before your round, be sure to stretch out for at least 5 to 10 minutes and get warmed up. Stretch again after the round and then maintain your training to ensure a long and healthy season. Good luck and hit ‘em straight!